When it comes to efficiency and space saving abilities, nothing beats a ceiling fan. The use of this type of fan allows you to enjoy cool breeze without taking up too much space in your home. One of the most popular ceiling fans that you can find in the market is the Hampton Bay Ceiling Fan. It is well known for its ease of installation and assembly. But one problem that most users have with this ceiling fan is it is a bit difficult to disassemble or remove. As compared to most ceiling fans, this is challenging to remove because its screws are concealed and the fan can be a bit heavy. If you wish to find a way on how to remove Hampton Bay Ceiling Fan, we recommend that you read this article! Step 1: Turn off the fan. Step 2: Using the Phillips screw driver, remove the screws that secure the blade arms of the fan to the ceiling. Step 3: Using the drill and the Phillips driver bit, remove the screws which attach the ceiling’s mounting bracket to your electrical box. Step 4: Test the wires. Step 5: Remove the wire nuts that are keeping the wires together. Step 6: Remove the fan from the ceiling. Turn off the ceiling fan at the main breaker or your fuse panel to avoid unwanted accidents. Moreover, you should also turn off all wall switches for safety purposes. If you also wish to remove the blade from the blade arms, just simply slide the flathead screwdriver under the plastic band located at the bottom of the blade. Push back the arms of the blade to allow the screws to go into larger opening of the blade arm’s keyhole. Once it goes in, you can finally life the blade off. Pro Tip: Removing the blades from blade arms will make it easier for you to lift off the entire fan as it will be lighter. 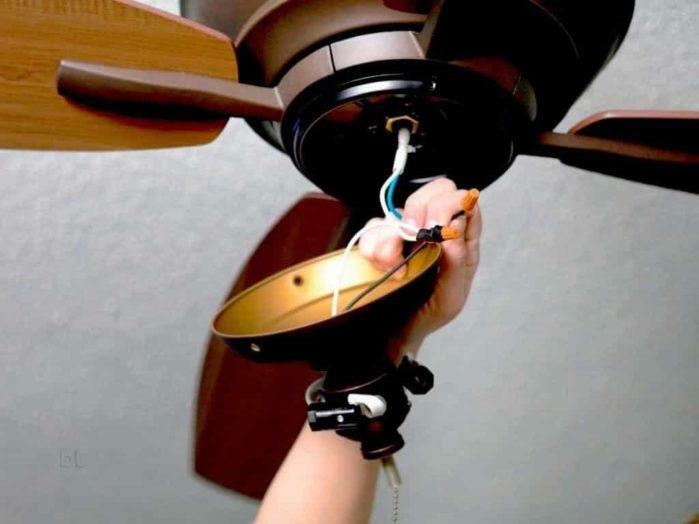 This is also a good move to take if you plan on cleaning your ceiling fan. After removing the screws, slide the bracket down the hanger of the ceiling fan. After removing the mounting bracket, you will have access to the fan’s wires. Pull out the wirings from the electrical box then hold the tester against them. Make sure that the wires have no electricity running through them. You will find three wiring connection colors—white to black and white, black to blue and black, and green to green. You need to separate these wire connections using an electrical tape. Using your two hands, grab the hanger and lift it up. When you do this, the ball assembly is also lifted off from the bracket which is attached to the electrical box. Remove the hanger from the bracket to give way for the ceiling fan. Lower it to the floor. Removing Hampton Bay ceiling fan is not as difficult as you think it would be. However, it can get a bit dangerous, especially if the wires still have electricity running through them. If you wish to enjoy an easy breezy process of how to remove Hampton bay ceiling fan, you should follow the steps that we have provided.